Whom to Believe Oh God? Media is one of the basic source of information. But who will tell us whether what the media gives would be the correct information? These media reports speak for themselves! I Did Not, Manorama Said It! If I say some thing about aggressive privatization, they will call me a communist. Now read two news reports on Malayala Manorama and try to think about tomorrow. According to the first report, Central finance minister Mr. P. Chithambaram has said that more in stock regarding privatization and economic liberalization. The second one says, Central Excise Intelligence has issued notice to those private insurance companies for cheating the government on tax amounting over 300 crore. I thought India became an independent nation in 1947 and a Democratic sovereign Republic in 1950 and that itself from Britain and not from United States. There has always been a tendency on the part of US political leadership to consider other nations as slaves or as subordinates and US playing the 'world police' role. This is the most recent example for that attitude towards India. Oh yes another one, when Barack Obama the president who is running for a second term made a comment that 'India is not investor friendly'. H.H. Baselius Marthoma Paulose II Catholicos of the East is in Abu Dhabi and, among several things he did, also addressed a press conference. He was naturally very much disappointed about the way the governments responded to the just cause of the Malankara Church. He expressed his opinion before the press. Most of the media persons reported faithfully his words. 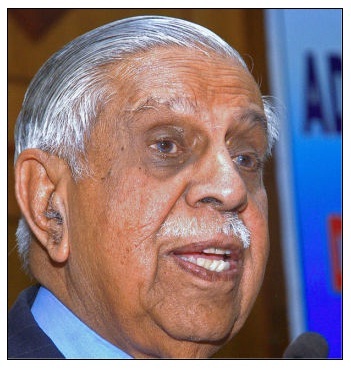 But Manorama heard only what he said about the world affairs. Malayala Manorama daily is world renowned and has won several media awards. Piravom St. Mary's Orthodox Church has once again become a battle ground between Orthodox Church and Puthencruz Jacobite Society Church. All the members except none has, after an express court order, accepted the binding nature of and sworn allegiance to the 1934 constitution of the Malankara Orthodox Church in writing. They have been conducting elections in the Church according to the 1934 constitution and office bearers are being elected. This being the case, the Jacobite Society Church people claim that their members are majority in the Church. Prof Ninan Koshy noted economist and former officer with WCC, wrote a book "Palliyum Partiyum Keralathil" (Church and Party in Kerala). 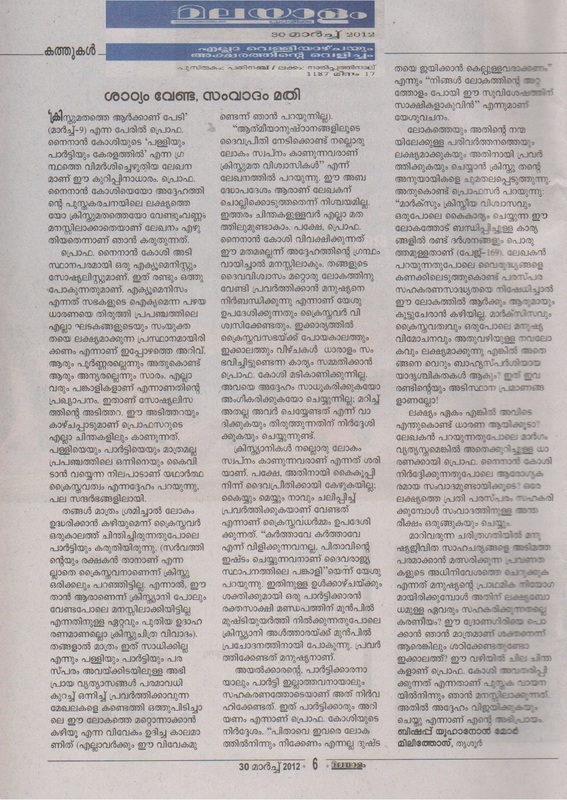 Some one wrote in Samakalika Malayalam Weekly a biased and totally negative review. I wanted to challenge that. Here is my note in the same weekly.